The prospect of stabilizing commodity prices and improving corporate earnings has helped rebuild investor interest in emerging markets over the past year. But returning investors may find the constituents of today’s emerging markets are very different from those of the past. I’ve invited my colleague Carlos Hardenberg to share some of his experiences of how emerging markets are not just emerging but evolving, too. When we look at the emerging-market companies in which we invest today, they are worlds away from the companies we were analysing a decade or two ago. The landscape of emerging-market corporations in general has undergone a significant transformation from the often plain-vanilla business models of the past that tended to focus on infrastructure, telecommunications, classic banking models or commodity-related businesses, to a new generation of very innovative companies that are moving into technology and much higher value-added production processes. Furthermore, we’re starting to see the establishment of some very strong globally represented brands which originate from emerging-market countries. Back in the late 1990s, when I was starting out in the emerging-market investing world, technology-oriented companies made up only around 3% of the universe, as represented by the MCSI Emerging Markets (EM) Index.1 Even six years ago, information technology (IT) represented less than 10% of investable companies in the index.2 Much has changed since then. 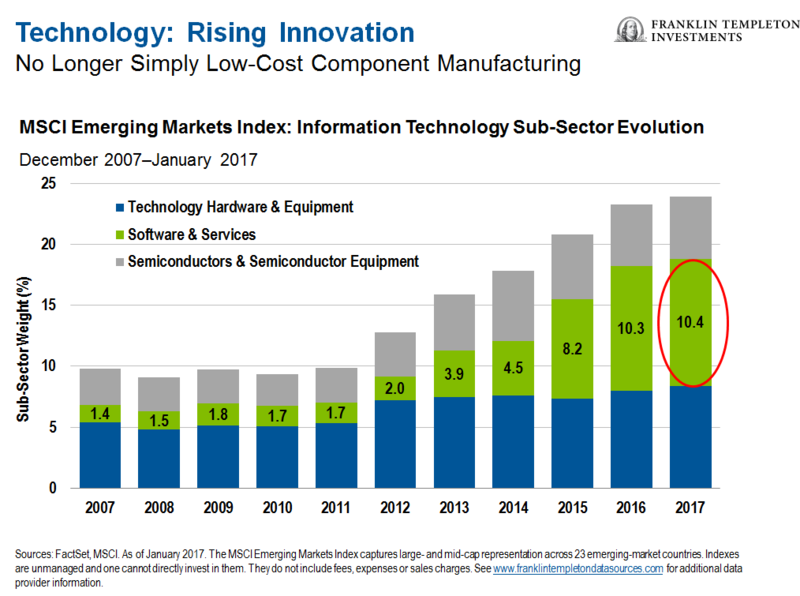 Today, around a quarter of the MSCI EM Index is in the IT sector, which includes hardware, software, components and suppliers. And while much of this activity is originating in Asia, including Taiwan, South Korea and increasingly China, we are also seeing similar developments in Latin America, Central and Eastern Europe and even Africa. The IT sector can be a difficult space to understand and value. Business models are rapidly changing as they adapt to the shifting demands of consumers, and respond to new environmental requirements. Thus, one needs to spend more time understanding and evaluating individual companies before investing in the right stocks, also based on desired risk tolerance. Currently, we have identified opportunities among some larger-sized companies, but tend to generally favour mid-sized companies we think have the potential to outgrow the market as a whole. We look for companies we believe have the ability to adapt more efficiently and are more flexible in adjusting to a fast-changing environment, run by flexible and well-incentivised management teams. While there has been a considerable evolution in the emerging-market investing universe over the last decade, we remain adamant in our belief that emerging markets remain an investment asset class in which active management should play a vital role for a number of reasons. Emerging markets tend to have their own business rules and regulations which affect companies, corporations differ largely in their attitude towards minority investors, governance standards vary significantly and local intricacies determine consumer trends and habits. We often need to develop fairly close relationships to gain a better understanding of business prospects and find successful management teams that respect the rules. We think these factors could be an important consideration as attention returns to emerging markets on the back of the generally improving performances we have seen in these markets recently. 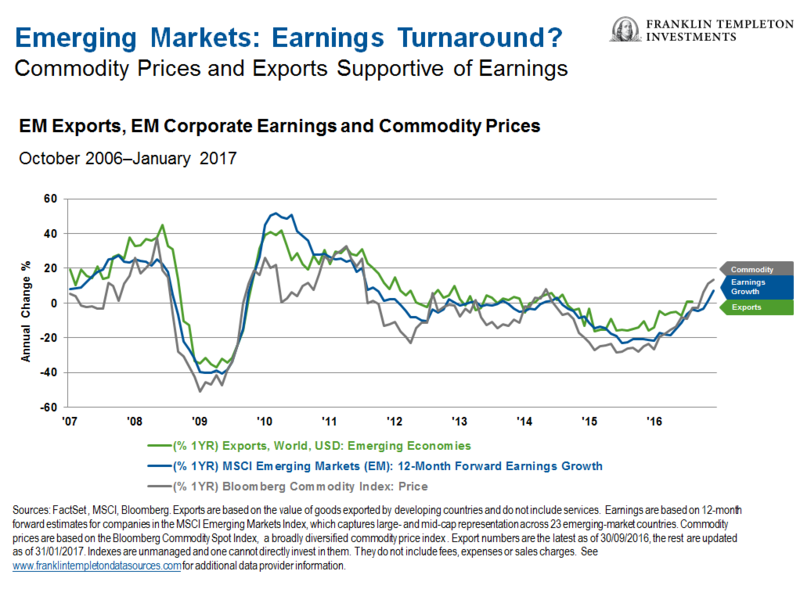 After more than three years of languishing at depressed levels, earnings in emerging-market companies are showing signs of recovery, and that is reflected in the attitudes of companies and their management as well as in their financial data. Recently, on a trip to Dubai, my team and I met a range of companies from Africa, the Middle East and other emerging markets, which were far more confident and open in sharing their outlook for the next 12-to-24 months. Even in regions that are still going through a phase of adjustment and rebalancing, we see improving visibility and increasingly evident robust underlying economic conditions such as low debt, stabilizing commodity markets, reduced currency volatility and improving consumer confidence. After a relatively bleak period for emerging markets, it seems that many of the factors that have attracted investors to the asset class, including stronger earnings growth, higher gross domestic product growth levels and far more attractive consumer trends, may be coming back into play. 1. Source: MSCI. The MSCI Emerging Markets Index captures large- and mid-cap representation across 23 emerging -market countries. 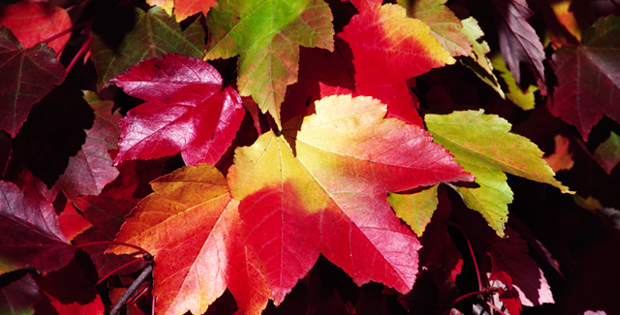 Indexes are unmanaged, and one cannot directly invest in an index. They do not include fees, expenses or sales charges. See www.franklintempletondataservices.com for additional data provider information.